Ok Dk.. slight modification to the "District"-level maps. This is the 3rd in the series but will be uploading the 1st two again. I added some things that make the others obsolete. No longer does this map scale show one district. The KE is just too convoluted to do this as you can see from the big macro map I uploaded. The maze looks worse than it is when you consider the scale involved, thousands of light years are shown on the big map. This also adds a small number to each area on the map, like the "18" in the Ladeffye County. The 18 actually is the district number from the Macro map. It refers to the entire space bordered by the red-yellow dotted borders, similarly "63", "67", etc. 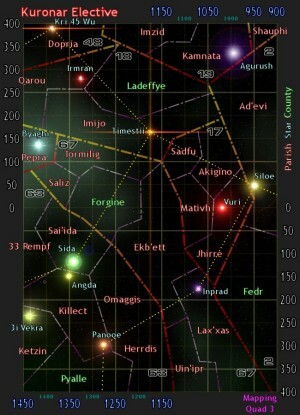 Also added are the legend to the side showing what colors are assigned to Parish names, County names, and Star names. But enough details... hope you like this newest map format... please comments are appreciated.. Please don't take this the wrong way, but it looks rather confusing to someone who isn't totally versed in your campaign! I think part of the problem is that the same font is used for all three administrative levels. What software did you use to generate this stuff? Good point.. Paintshop Pro by hand. I might try different fonts later, but this one seemed to work the best. I am not too concerned with this level as its more of a intermediate stage to the next level of zoom where its much easier to see what is going on. I'll remember what you said though when I get back into these maps.